Der Autor unterscheidet und beschreibt sechs Bereiche des Handheld-Einsatzes in der Schule: educational communication, managing, multimedia access, games and simulations, data collection, and context-aware applications. Handheld educational applications have been reviewed by different researchers from different perspectives. However, there are very few comprehensive reviews based on handheld research reports published in journal articles, conference proceedings or as book chapters. In addition, the consequences brought about by handheld educational applications have rarely been analyzed and reflected upon. Understanding the resultant effects from these practices is critical for future research directions. The purpose of this review on handheld educational research is thus to understand the consequences arising from the educational practices and their implications. 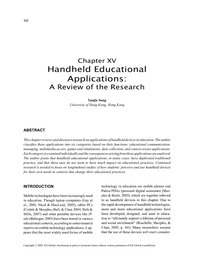 This chapter reviews and discusses research on applications of handheld devices in education. The author classifies these applications into six categories based on their functions: educational communication, managing, multimedia access, games and simulations, data collection, and context-aware applications. Each category is examined individually and the consequences arising from these applications are analyzed. The author posits that handheld educational applications, in many cases, have duplicated traditional practice, and that these uses do not seem to have much impact on educational practices. Continued research is needed to focus on longitudinal studies of how students’ perceive and use handheld devices for their own needs in contexts that change their educational practices.